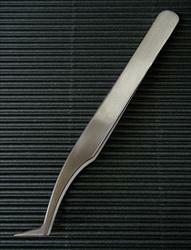 These stainless steel tweezers are 4.5 inches long. The needle tip is bent at an angle to make it easier to pick up tiny objects. These are great tweezers for stamp collectors and artisans!